The Lancaster Museum/Art Gallery (now known as Lancaster Museum of Art and History or MOAH) was officially dedicated January 18, 1986 at the Sierra Highway location. The Museum's metamorphosis continued as construction began on the new building with a historic groundbreaking on February 23, 2010. Located on the corner of Lancaster BLVD and Ehrlich Avenue, the new Lancaster Museum of Art and History provides additional space for expanded programs and exhibitions, updated architecture, and a central location on The BLVD. 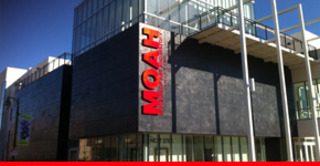 The Museum officially opened on May 5, 2012. The museum also houses a collection of art pertaining to the Antelope Valley region. This art was created by artists that lived in, worked in or were inspired to create by the region. Rotating art exhibitions focus on contemporary artists, as well as the art housed within the current collection. In addition, the museum has a vast collection of Native American, historic artifacts and geologic specimens pertaining primarily to the Antelope Valley and its surrounding areas. Many of these items will be on permanent display within the museum, while others make up some of the history themed rotating exhibits showcased throughout the year.